I am blessed with two happy children - Rishab (6) and Saanvi (2). Rishab spent a large part of his childhood in South Korea, where we lived for seven years. It would be suffice to say that Rishab taught us a lot of things about parenthood. We were literally on our own in Korea - no parents, no relatives, no housemaid, and no nanny. But that wasn't necessarily a bad thing! I learnt how to change diapers single-handedly, something I could never do in my effing life. When Rishab was born, you could simply tell by the look on his face that he had just soiled his diaper. This happened after every feeding, before bedtime, and every time we went outside with him. Initially, I couldn't catch the signs properly. It's funny how little you know about basic baby care until you are thrown into parenting. Changing diapers seemed easy, and once you know "how", it is. For me, however, putting that daunting diaper on Rishab was such a tall order. Most diapers available at that point in time focused on being leak proof, ensuring dryness on the outside only. What Rishab insisted, er, demanded was dryness on the inside! A dry diaper kickstarted his happy mood, something that took both me and Sadhna awhile to understand. Thus began our frantic search for a diaper that could remain dry not only from the outside but also from the inside. Luckily we discovered the Pampers Baby Dry Pants with Magic Gel on recommendation of a Korean friend. A super-absorbent diaper like Pampers is really a blessing in disguise for doting parents. You can tell if the diaper is wet by its urine indicator or by feeling "lumps" in its absorbent material. The Magic Gel instantly absorbs wetness, keeping the baby's skin dry and healthy. Most diapers should not stay on a baby for more than four hours if wet, as it could lead to rashes or skin irritation. 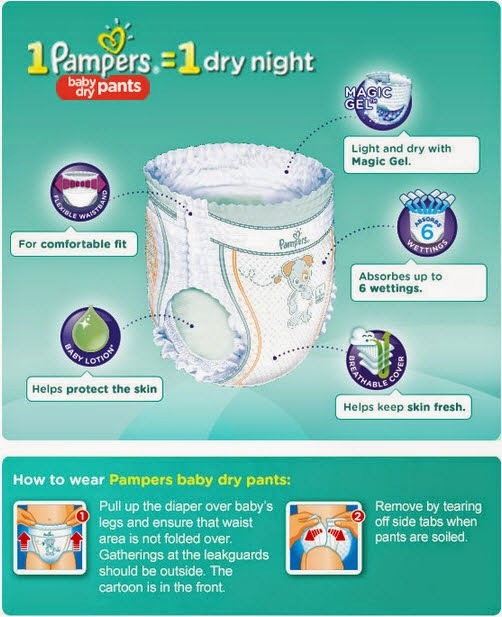 The Pampers Baby Dry Pants, on the other hand, provides dryness for up to 12 hours nonstop. It truly is a high-quality nighttime diaper. The Dry Pants are so easy to pull up and down; almost anyone can master the art of changing diapers within seconds. Before Pampers, we were constantly worried about Rishab's tender skin coming in contact with the wetness of urine whenever he exerted pressure on the diaper at the time of sitting, standing, falling, or even toppling. The Pampers Baby Dry Pants prevented urine from coming back to the top, promising a long-lasting spell of dryness. I felt super-duper by the time Saanvi was born, more confident about my parenting skills. So there, if your quest is for a happy baby, get Pampers for a dry baby.